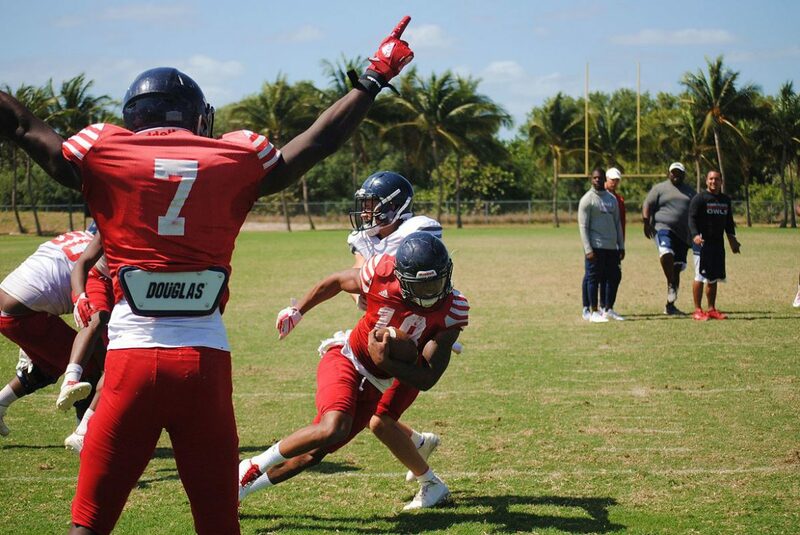 BOCA RATON – Quarterback De’Andre Johnson continued his rapid spring improvement during a Saturday scrimmage otherwise controlled by the defense. Running primarily with the first team, Johnson connected on the only big passing play of the afternoon, a 50-yard touchdown strike to Willie White, who had gotten behind Jalen Young down the middle of the field. Johnson missed all but the first game last season while recovering from surgery to remove blood clots in his arm. Wright led the Owls in receptions and receiving yards as a true freshman but had been held out of contact all spring until Saturday. At the beginning of spring Johnson struggled with accuracy and velocity, but both aspects of his passing game are improving as spring progresses. Johnson did most of his damage with his legs on Saturday, but nearly had a second long hook-up with Wright. Officials ruled that the speedy sophomore lost control of the ball as two defenders attempted to pry it away from him while he went to the ground in the end zone. Johnson is battling redshirt freshman Chris Robison for the starting quarterback spot. 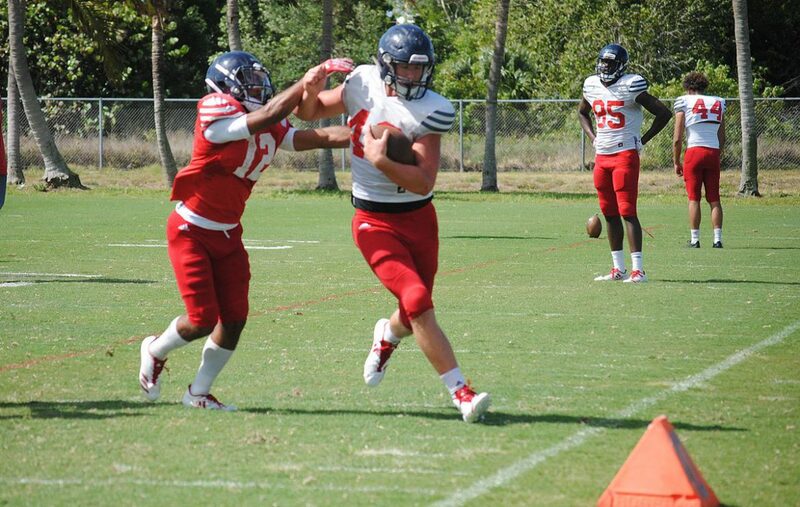 Robison, a transfer from Oklahoma who ran FAU’s scout team last season, didn’t fare as well on Saturday. Working primarily with the second team, injuries to the wide receiver corps and a lack of depth along the offensive line hampered Robison’s ability to consistently move the offense. “Chris made some plays moving out of the pocket,” Kiffin said. 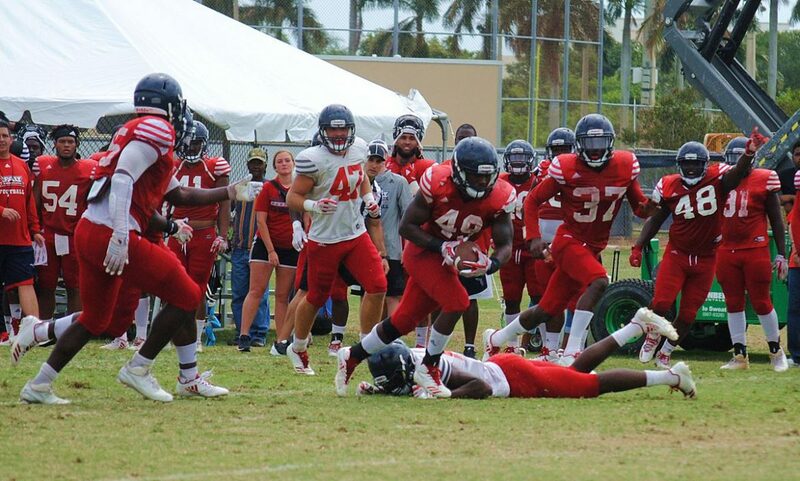 FAU’s defensive line and linebackers constantly harassed both Johnson and Robison in the backfield. 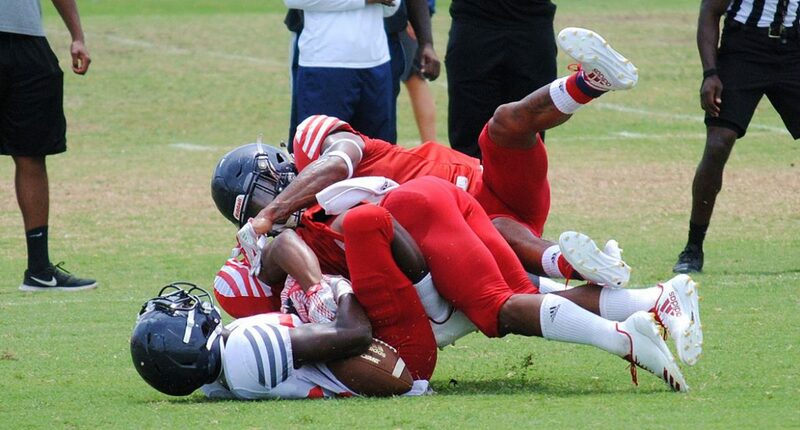 Second team linebacker Khantrell Burden turned in the biggest defensive play of the afternoon, scooping up a botched exchange between Robison and wide receiver John Mitchell ruled a fumble rather than an interception and racing to the end zone. “Defense probably dominated for the most part, which a lot of times when you don’t tackle that happens because you are not getting missed tackles, you are not falling forward on spots and stuff,” Kiffin said. 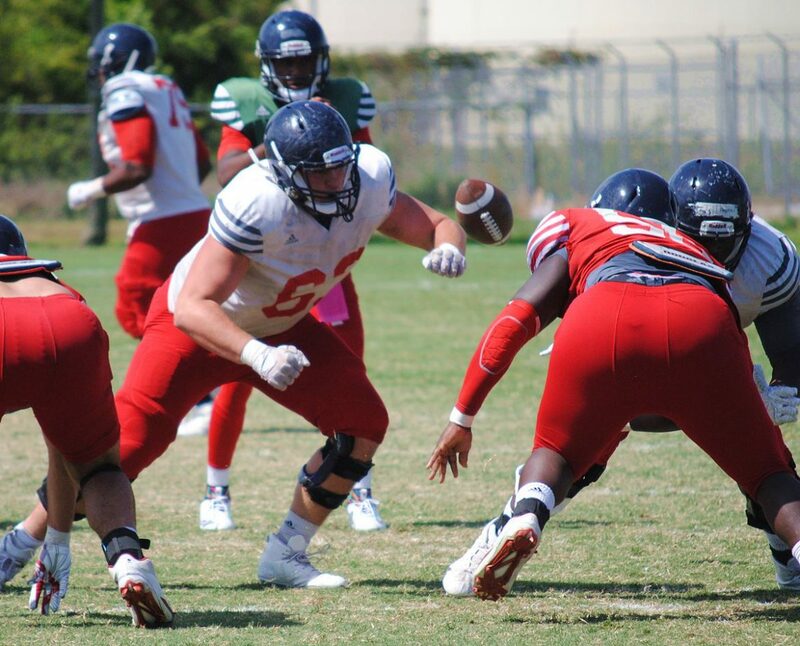 Making Plays: The defensive front six loaded up on sacks, with linebackers Rashad Smith, Hosea Barnwell, Jacob Douglas, Khantrell Burden; and defensive linemen Hunter Snyder and Leighton McCarthy among those getting to the quarterback at least once. 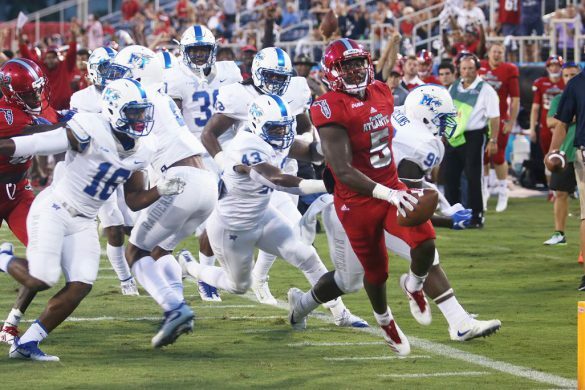 …The Owls are thin at running back this spring, but D’Anfernee McGriff did provide a spark with a long touchdown run around the left side. 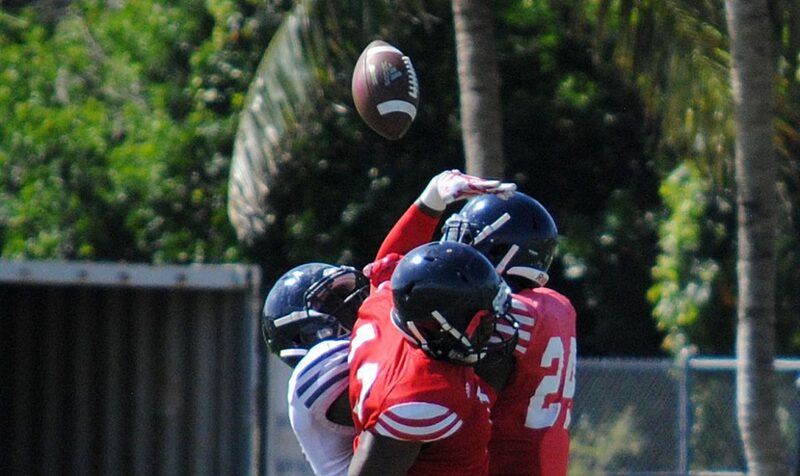 …Linebacker Akileis Leroy made a strong stick on running back Daniel Leconte in the hole on a fourth and short. Tracking the Depth Chart: With cornerback Shelton Lewis momentarily sidelined, James Pierre moved up to the first team and immediately broke up a Robison pass intended for Brandon Robinson. Pierre played safety last season as a true freshman. Kiffin sees NFL potential in Pierre. 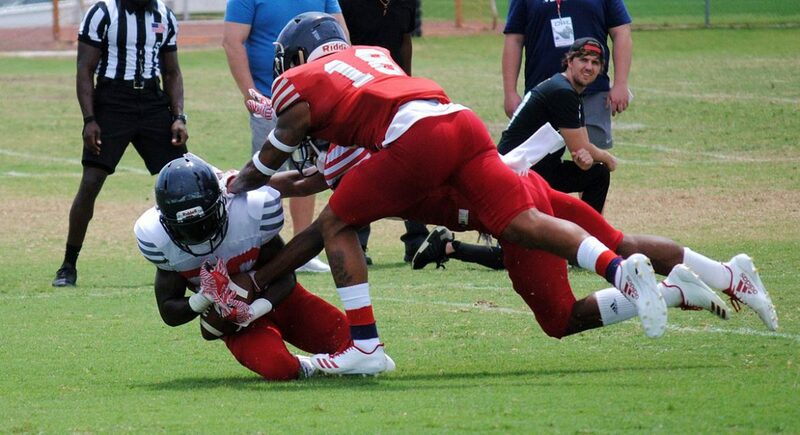 …With Jovon Durante, DeAndre McNeal and Pico Harrison among the wide receivers held out of the scrimmage, walk-ons Dante Cousart and Robinson are seeing plenty of opportunities. 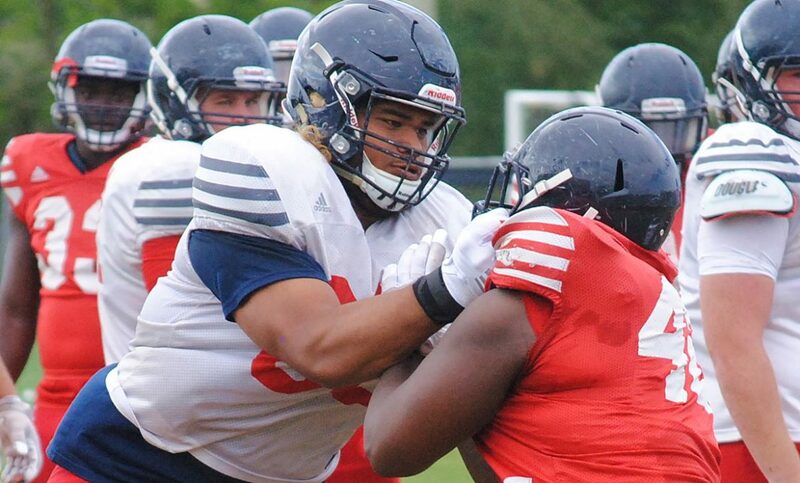 …For the second consecutive practice, walk-on Nick Webber played guard with the first team offense in the spot previously occupied by William Tuihalamaka, who dropped to second team. 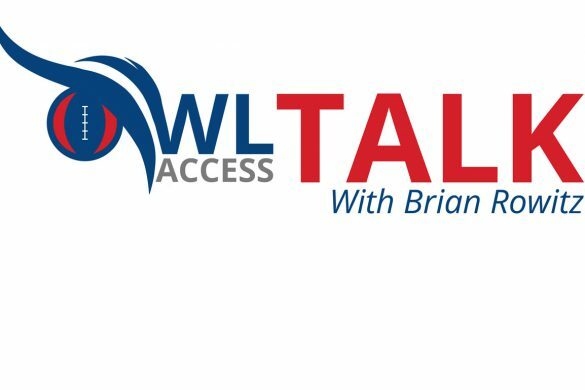 …Kiffin said oft-injured Richard Williams, a candidate to start at center for the Owls, has elected to no longer play football. Williams has not participated in a practice all spring. Newcomer Watch: Robert Hawkins, Jared Nourse, Jake Jones and Ean Biancardi all worked with the second team offensive line. All are redshirt sophomores or younger. QB Battle: Johnson is a far more elusive runner than Robison, but Robison showed on Saturday that he, too, is capable of making plays with his feet. BOCA RATON – Lane Kiffin is looking for local NFL players and former NFLers to help with a fundraiser for the victims and families of April’s Parkland-Douglas shooting. 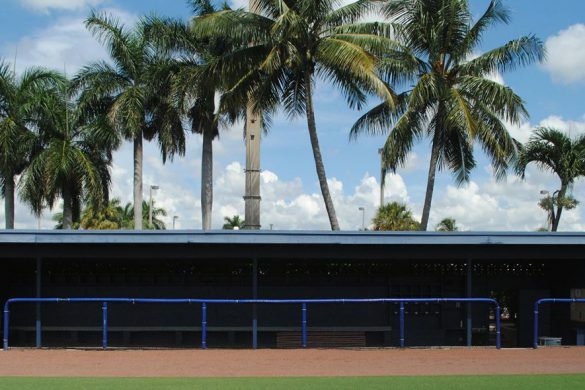 Saturday’s practice at Carter Park in Fort Lauderdale will serve as the centerpiece for the fundraiser. 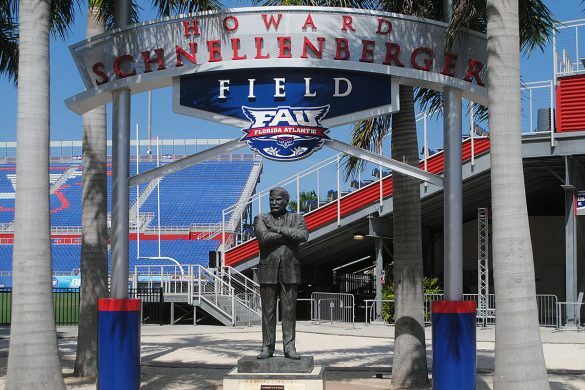 Practice on Saturday will begin at 10:30 a.m. and will be followed by youth camp where FAU coaches, at least some FAU players, and special guests will provide instruction. “Trying to get some NFL players and former players down there to help out as well,” Kiffin said. Kiffin mentioned Warren Sapp as being a former player who might be involved, adding that he’s hoping some of his former players who went on to the NFL would also help. That academic break allowed several members of the Douglas football team to attend Thursday’s practice. 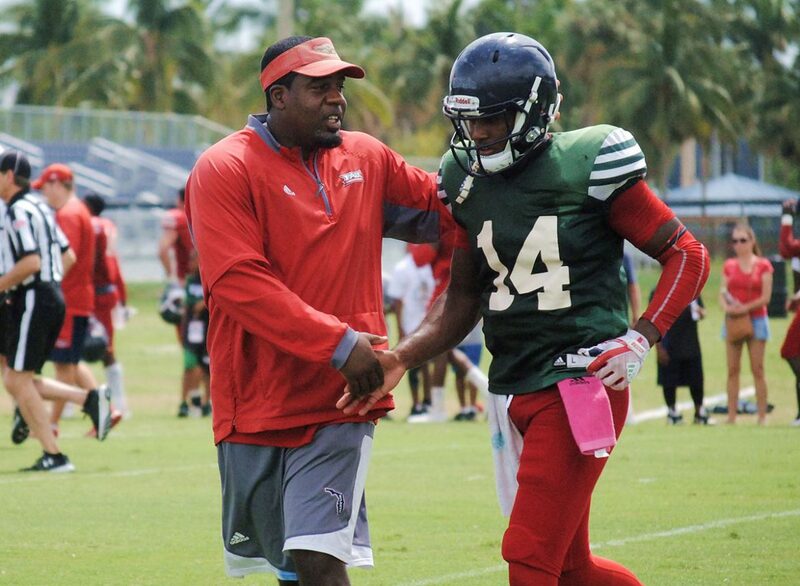 Afterward some of the Douglas players were able to spend time with some of the FAU coaches. 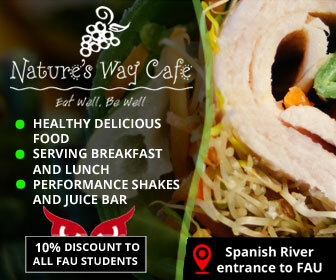 FAU is asking for a donation from all visitors who attend the Carter Park practice on Saturday, during which the Owls will raffle off a three-night stay at the Boca Raton Resort. 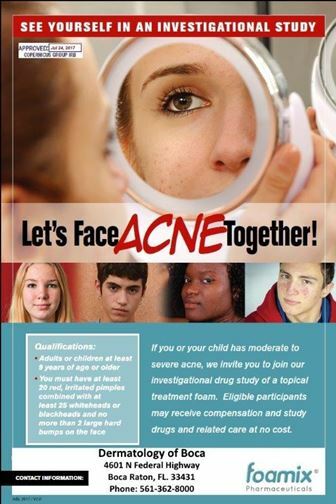 Participation in the youth camp, geared at kids from kindergarten through eight grade, will cost $20. “We had to go through some stuff with the NCAA to clear things to be able to do it, so we did it the best that we could,” Kiffin said. Seventeen people died on Feb. 14 when a gunman committed mass murder at Marjory Stoneman Douglas High School. 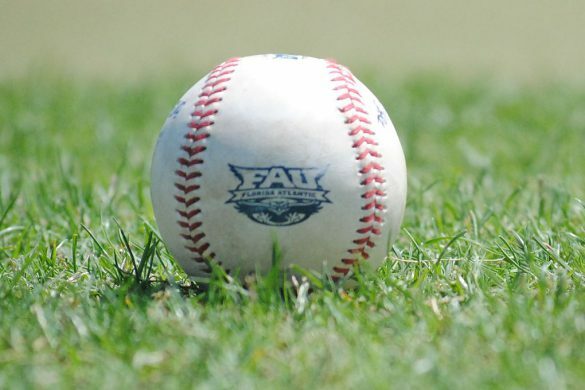 FAU baseball returned to its winning ways by sweeping a doubleheader from Marshall on Saturday. 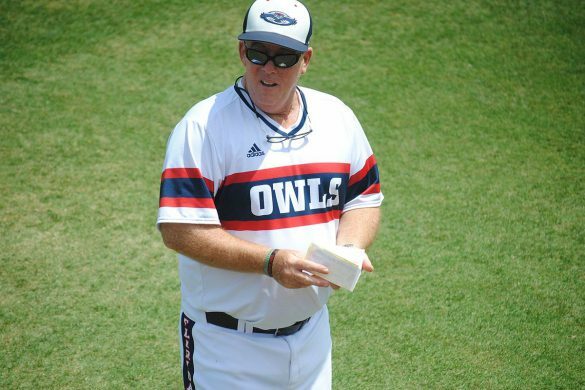 The 3-2 win in the opener snapped FAU’s first three-game losing streak of the season. 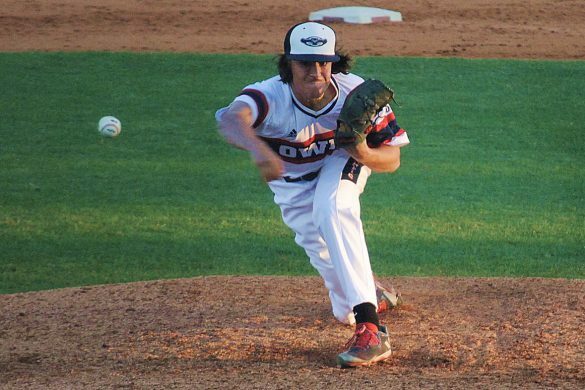 The Owls clinched the series with an 8-6 win in the nightcap. Trailing 2-1 in the eighth inning of the first game, Tyler Frank’s triple drove in Richie Nizza with the tying run. Joe Montes followed with a single down the left field run, driving in Frank with what would be the game-winning run. Andru Summerall’s second homer of Game 2 came in the seventh inning, giving the Owls a 6-5 lead. A two-run homer by Frank in the top of the ninth put the game out of reach. 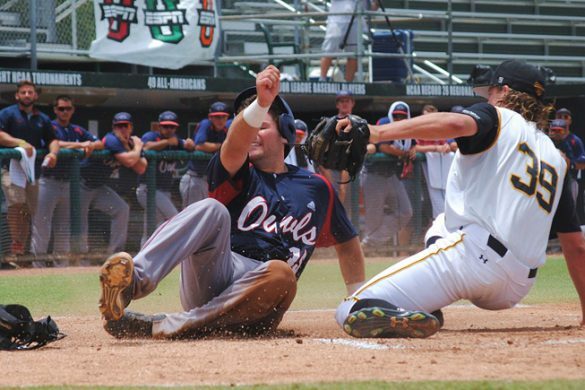 Moving Forward: Joe Montes had three of the Owls’ four hits in the first game, driving in two runs. …Tyler Frank extended his hitting streak to 21 games. 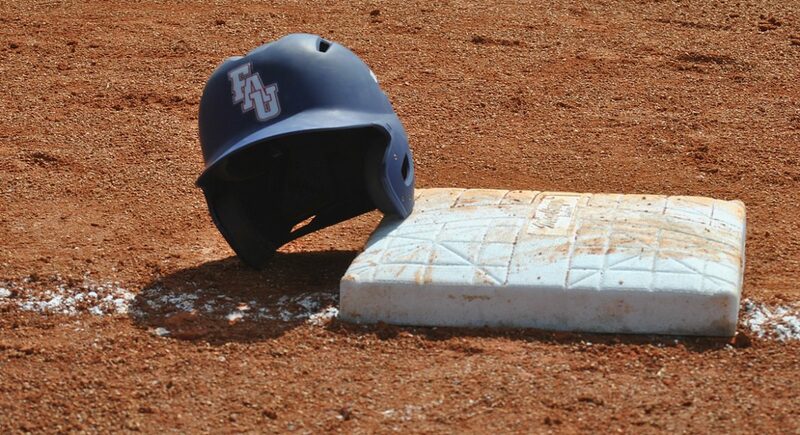 …Pitcher Jake Miednik allowed one earned run without walking a batter while striking out 10 in six innings the first game. …In the second game, Cody Wilson smacked his fourth homer of the season. …One of Richie Nizza’s two hits in the second game was his first home run as an Owl. Drew Peden picked up the win in the first game by tossing three scoreless innings of relief. …Matt Harris earned the first win of his career by allowing one run on three hits while striking out four in three innings of relief. 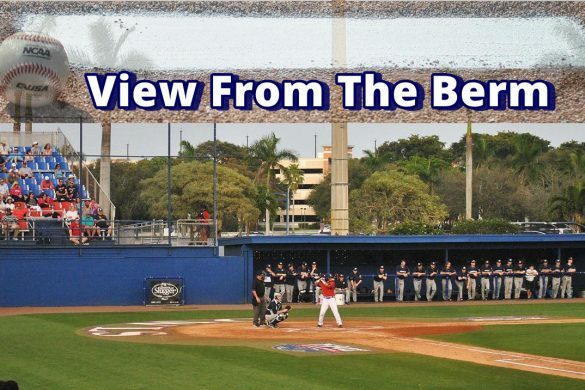 Sliding Backward: FAU’s third through ninth hitters failed to record a hit in the first game. 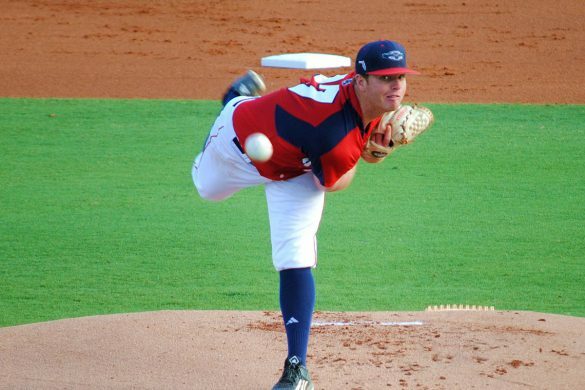 …Normally FAU’s Sunday starter, Vince Coletti started the second game and allowed four runs in five innings. …Weston Clemente’s struggles continued when he walked two and allowed one run in 2/3 of an inning. …Eric Rivera went hitless in six at-bats on the day, striking out twice. Key Stat: 5 – Homers hit by FAU in the second game. Up Next: FAU will send Mike Ruff to the mound in an attempt to sweep Marshall on Sunday. 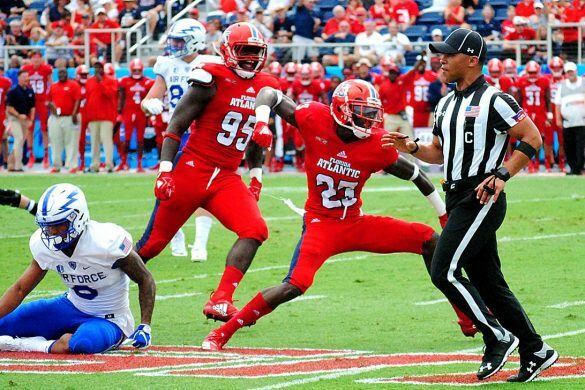 First pitch is scheduled for 1 p.m.
BOCA RATON – FAU cornerbacks Shelton Lewis and Chris Tooley play on opposite sides of the field, but their hometown connection creates a competition that transcends the turf between them. Lewis’ and Tooley’s standout play on the outside allows first-year defensive coordinator Tony Pecoraro to dial up pressure with little risk of giving up big passing plays. 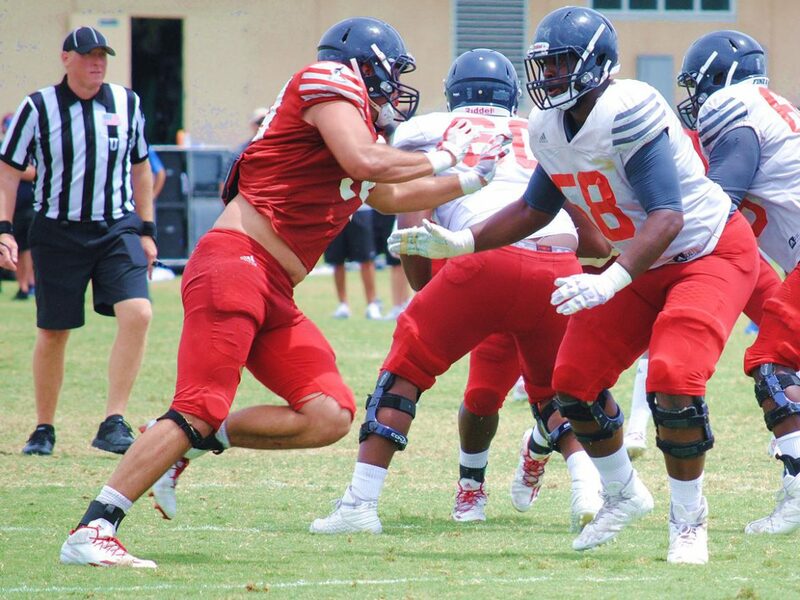 Having two shutdown boundary corners makes opposing quarterbacks think twice before getting rid of the ball; that moment of hesitation is music to the FAU defensive line’s ears. “It is real cool because if the quarterback can sit out there and pat the ball we can go to work.” defensive tackle Steven Leggett said. 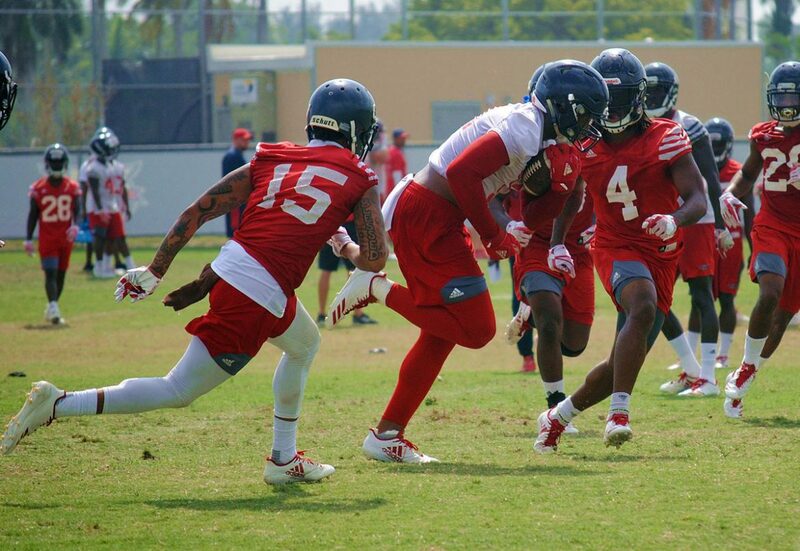 Coach Lane Kiffin views the secondary as the strength of the defense; adding that his corners’ ability to play man-to-man coverage is vital to FAU’s schematic versatility on defense. Lewis and Tooley are unafraid of being left alone in one-on-one situations – in fact they embrace Pecoraro’s attacking mentality on defense. Tooley, a junior, and Lewis, a senior, share a similar skill set; they both excel in off man coverage, displaying the explosive lateral quickness needed to break up quick throws and closing speed to track down passes on vertical routes. 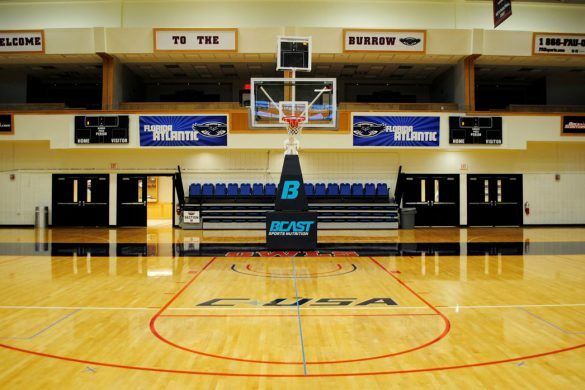 The two corners are definitely not short on confidence, as both are quick to celebrate at the offense’s expense every time they make a play in practice. Tooley likes to get in the head of opposing receivers by constantly reminding them ‘this play is mine’. 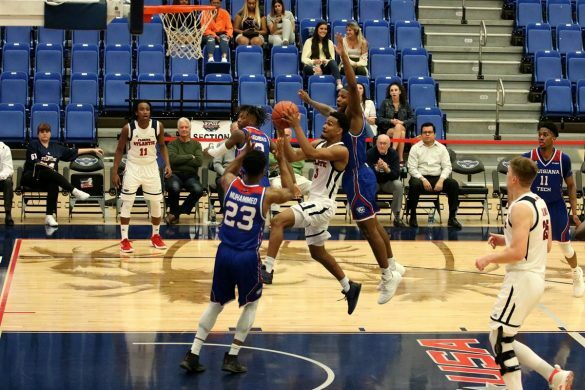 Separated by only 23 miles while attending high school in the Orlando area, Tooley and Lewis knew each other before becoming college teammates, and the chemistry they have built over the years has helped mold them into the players they are today. 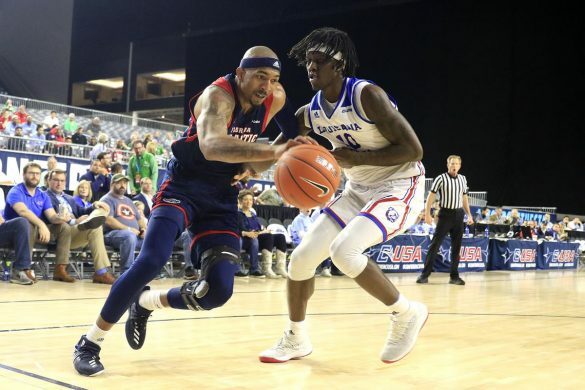 “We get to compete against each other and see who makes the better plays.” said Lewis, an All-Conference USA selection last season. It is fitting that the competition between Tooley and Lewis extended to the stat sheet, as both picked off four passes last season. While Lewis declined to say who would gain the edge in interceptions in 2018, Tooley seemed confident with his choice. Both Lewis and Tooley are more comfortable in their second season under Kiffin, and said their advanced familiarity of the defense will be a difference maker this season; Tooley added he can now predict where the ball is going before the opposing quarterback lets it go. Tooley and Lewis hold each other accountable and set a standard of excellence for each other that stretches beyond themselves to their entire unit. “We look up to each other and push each other to be dominant.” Tooley said. 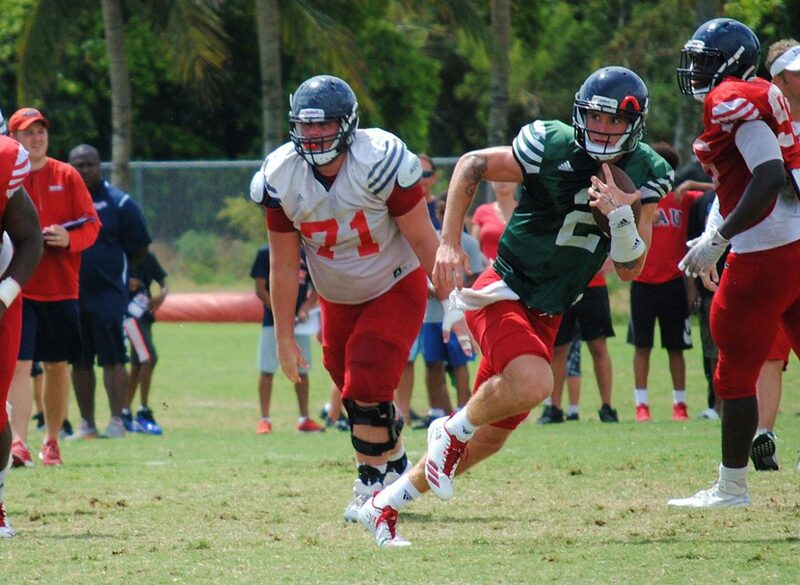 BOCA RATON – Lane Kiffin expects his current quarterback battle to carry into the fall. 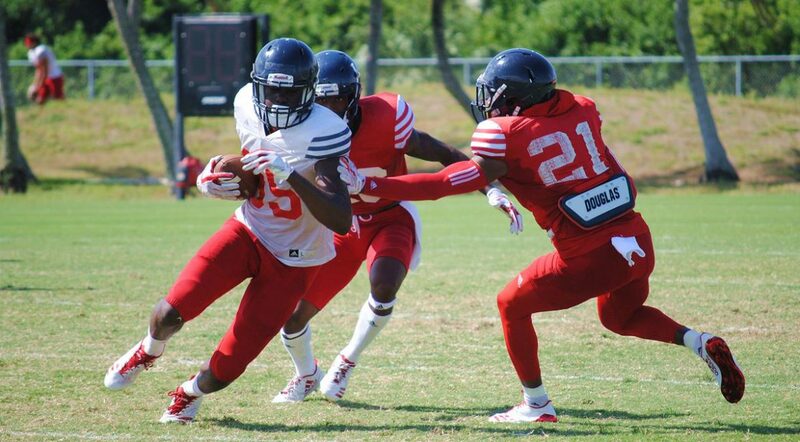 At the moment De’Andre Johnson and Chris Robison are battling to be the Owls’ lead signal caller. Johnson is working his way back from surgery to remove blood clots from his arm. He worked primarily with the first team on Thursday, and his arm appears to be getting stronger as spring progresses. 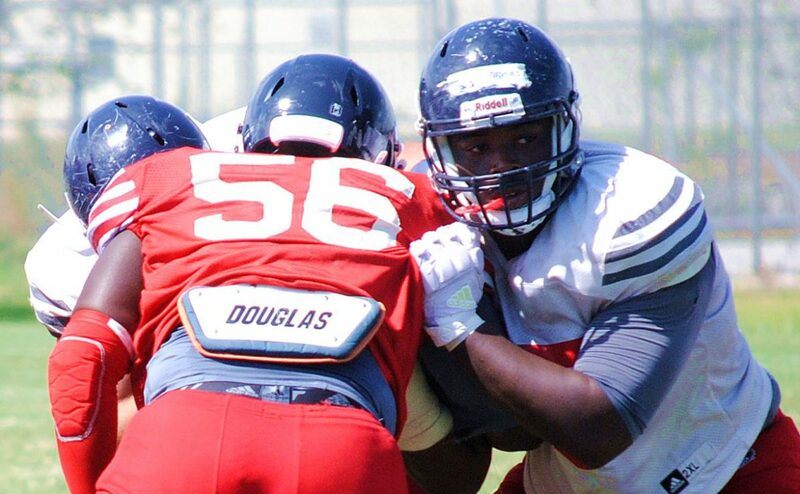 “De’Andre’s had some really good team periods where you kind of see him come alive in the team setting where it’s not drill work,” Kiffin said. 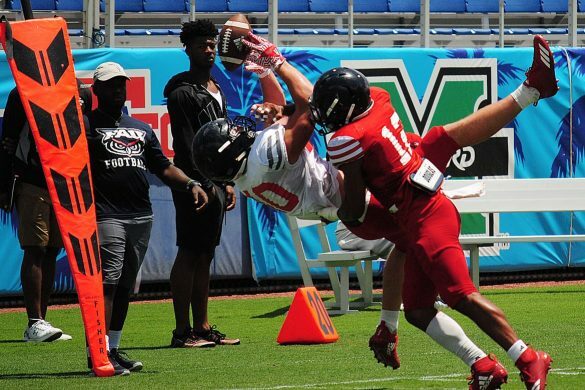 Johnson’s shown elusiveness throughout the spring, but in Thursday it was Robinson who turned in one of the biggest runs of the day, bursting around the left side on a read-option and racing to the end zone. 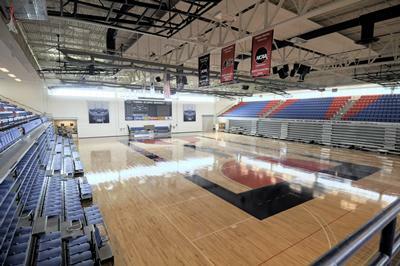 Johnson played in one game last season before the blood clot issue surfaced. 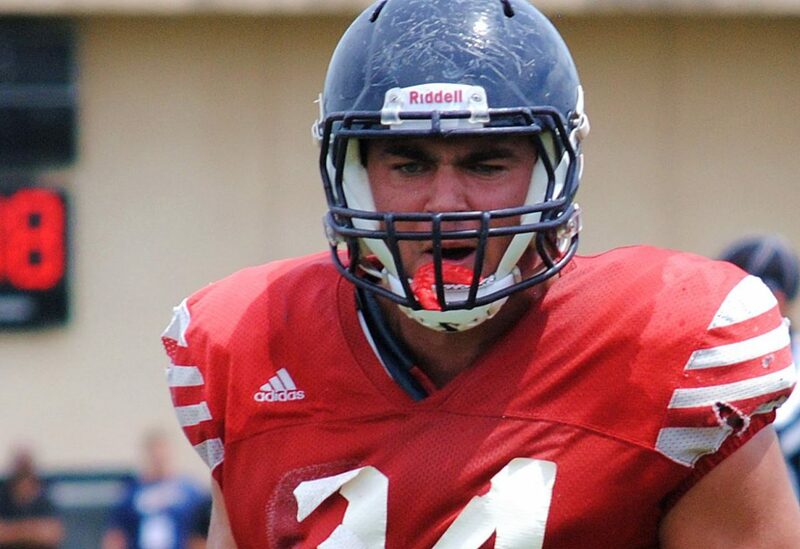 Robison, a redshirt freshman, ran the scout team after transferring to FAU from Oklahoma, where he had been dismissed from the Sooners after his arrest for public intoxication. Kiffin suspended Robison for the first practice of the spring for a minor violation of team rules, but Robison and Johnson have traded repetitions since the second practice. 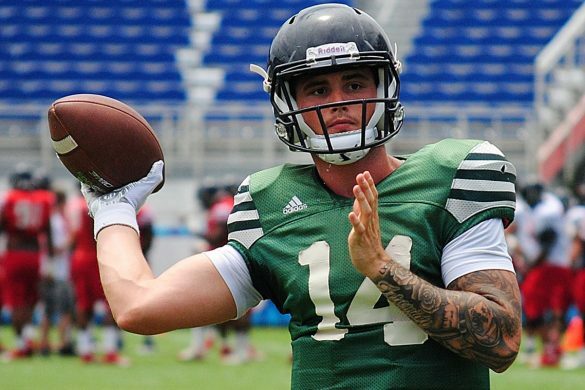 Should Kiffin not like what he sees from the quarterbacks during the spring, he could elect to bring in a graduate transfer in the fall to take over the spot. A rash of minor injuries to the wide receiver unit is complicating their competition. 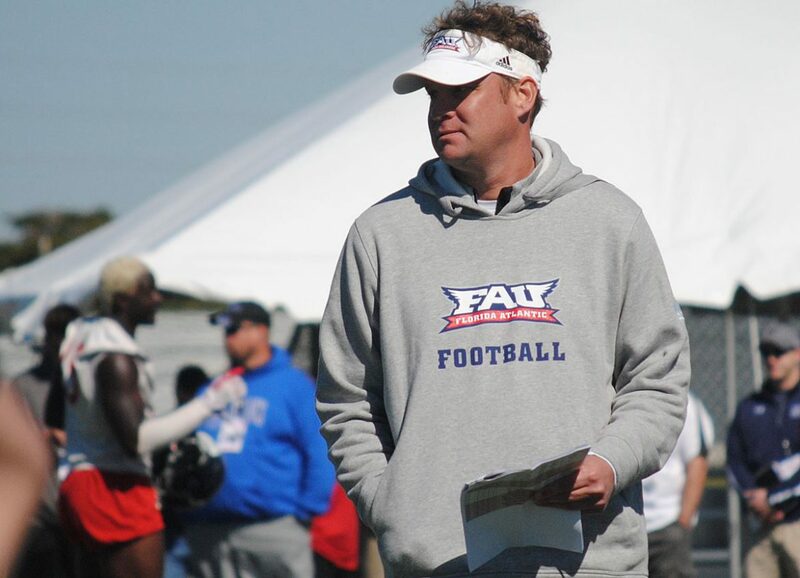 “You can still get a good read but it is tough for them to be extremely accurate when you’ve got so many different guys coming in and out, and hobbled and not 100 percent,” Kiffin said. 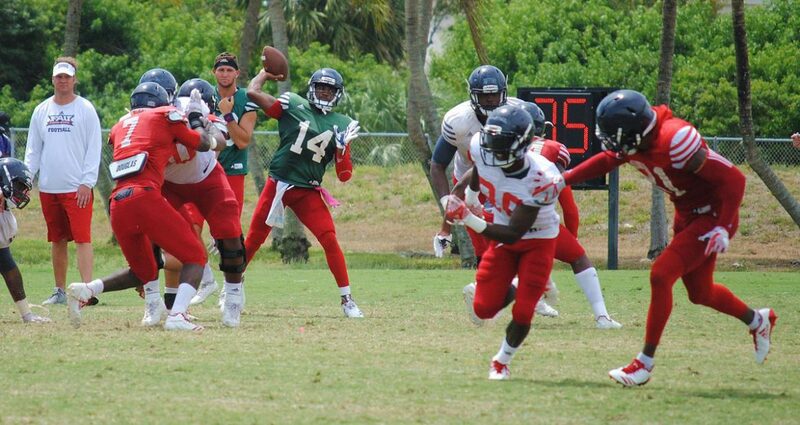 Five practices into the spring – following Thursday’s workout, 1/3 of FAU’s spring practices are now complete – Kiffin is letting the quarterbacks develop a feel for the offense. 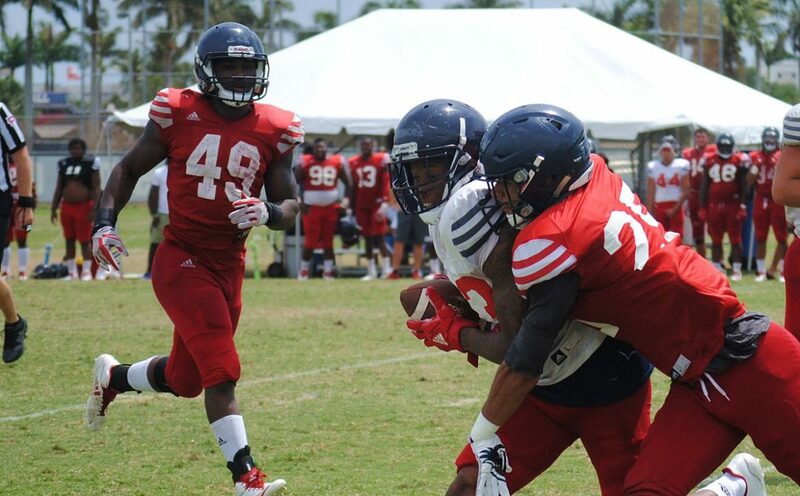 BOCA RATON – FAU boasts an explosive, big-play passing game, but its most dependable player is one who may not be as flashy as his counterparts. Coach Lane Kiffin focused on analytics this offseason, and found that tight end Harrison Bryant has been his most consistent pass catcher. Kiffin said the data he analyzed showed Bryant had an extremely high catch percentage on his targets. “Harrison was one of our most productive players and arguably the most productive player in the pass game,” Kiffin said. Kiffin said having Bryant as a safety valve for his quarterbacks is vital in preventing turnovers, and that his work down the middle of the field acts as a stabilizer for the passing game. The short and intermediate game is Bryant’s specialty; he is adept at finding the soft spots in zone coverage and beats man coverage by using his six-foot-five frame to box out smaller defenders and make plays in traffic. Last season as a sophomore, Bryant’s five touchdown receptions were second most among the Owls, while his 32 receptions were third most. Bryant appreciated his coach’s praise, but wants to be known for more than his receiving acumen. Bryant said blocking is one of the most underrated aspects of his game. 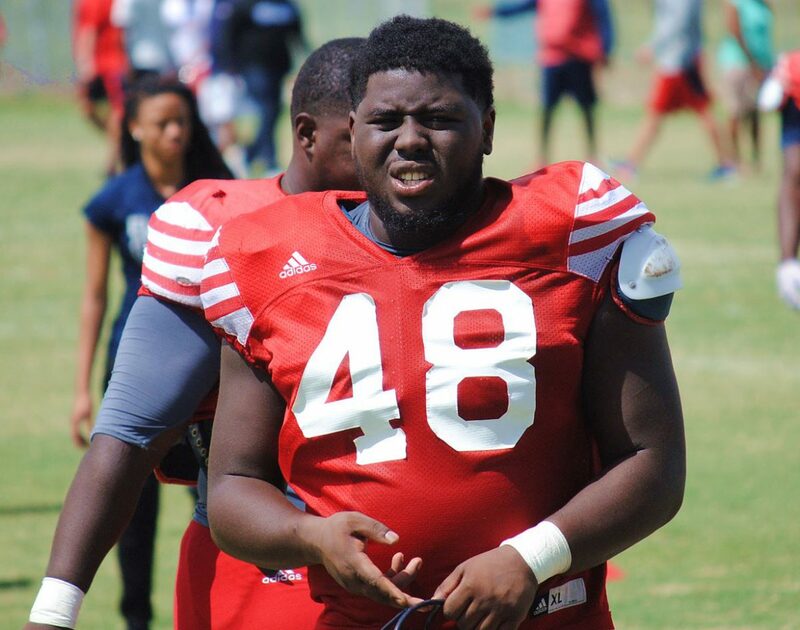 Bryant’s work maintaining leverage and creating holes in FAU’s zone blocking scheme is one of the reasons Devin Singletary has been one of the most successful rushers in college football. With a new-look receiver group in the fold this spring, Bryant has taken on a bigger chunk of the target share. Bryant acknowledged his role increased “to an extent” but said the receivers made plays when given opportunities. Regardless of how the receivers progress, if Kiffin needs someone to move the chains and score in the red zone, there is no one better than number 40. 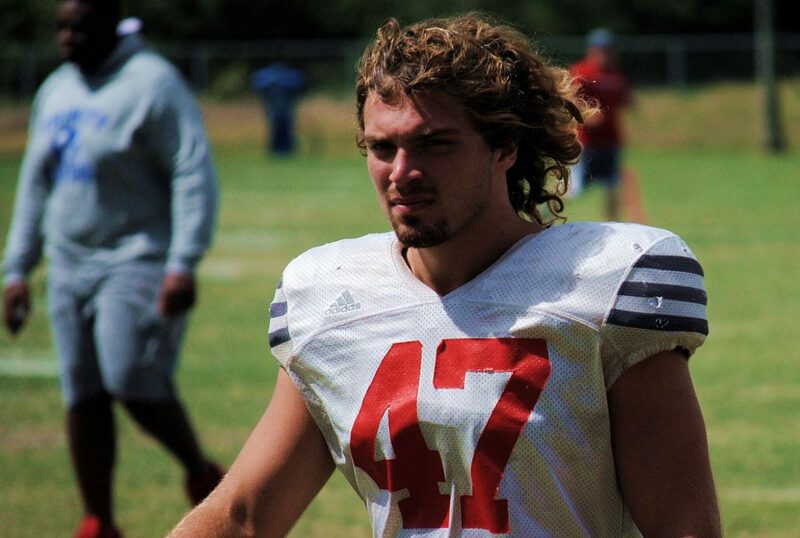 “He’s an NFL-potential tight end.” Kiffin said. Bryant is already gaining the trust of quarterbacks De’Andre Johnson and Chris Robison. He’s playing a bit of catch-up there, however. 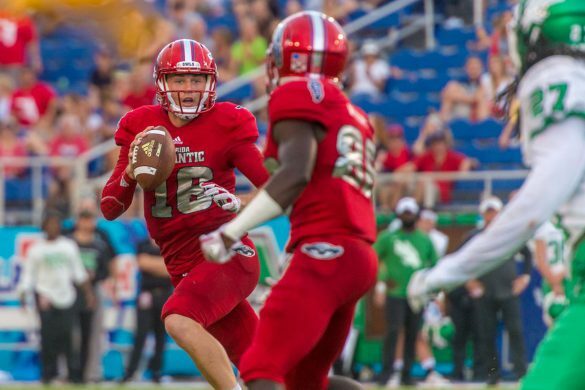 Bryant broke his football in FAU’s win over FIU in last season’s Shula Bowl. 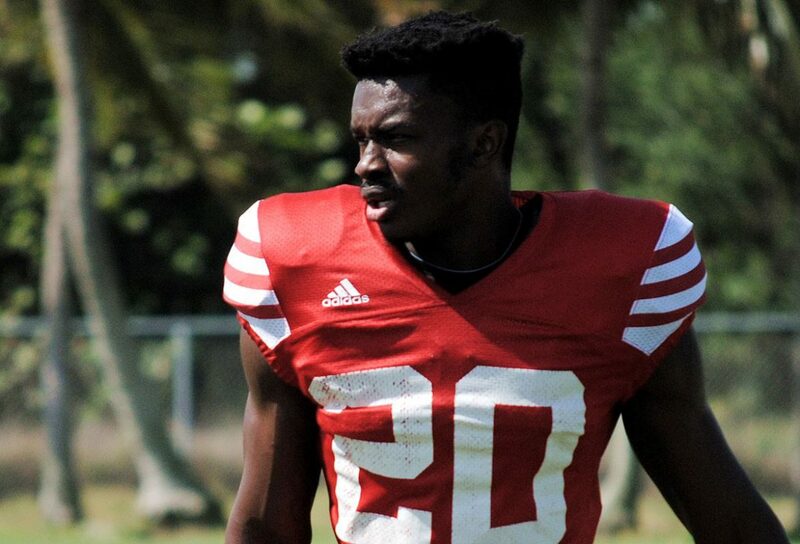 He wasn’t fully cleared to return to action until shortly before the start of spring practices. Kiffin deployed Bryant in multiple looks this spring, ranging from a traditional inline position, to H-back – even split out wide and in the slot. Wherever Bryant lines up, if the ball is thrown his way, good things tend to happen. 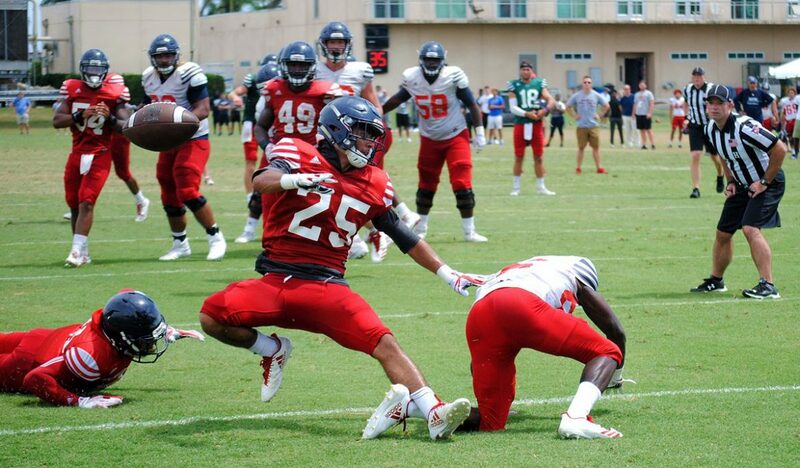 The Owls have also worked on getting Bryant on the field with John Raine in two-tight end personnel; giving FAU the luxury of extra blocking for Singletary in the run game, and two big targets in the passing game. 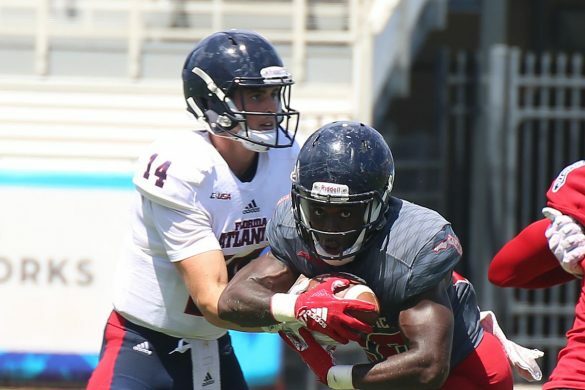 While he doesn’t possess game-breaking speed, Bryant is a technician at his craft; his crisp route running skills and sure hands are crucial to FAU’s offensive success. “Whenever my number is called I just try to make a play.” Bryant said. BOCA RATON – That John Franklin is fast is not news. 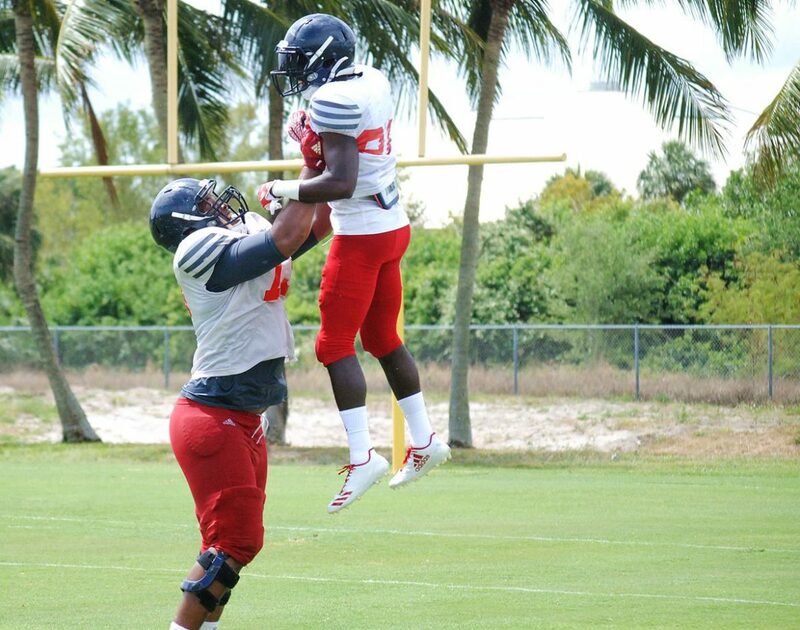 During Tuesday’s FAU Pro Day, Franklin wanted to show he is versatile, too. Franklin ran a disappointing 4.4 40-yard dash on Tuesday – a good time for certain but well off the 4.19 he reportedly ran during a training session. Running, however, was only part of his day. 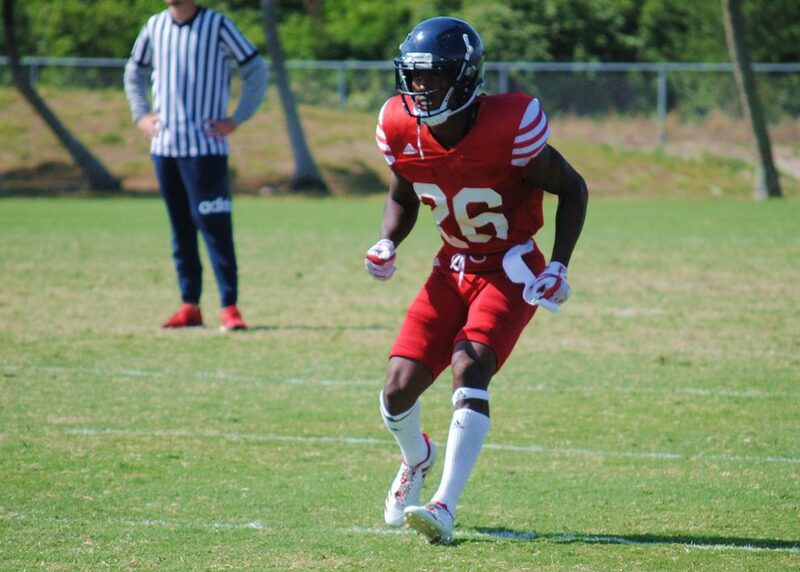 Franklin caught passes, threw some passes, participated in defensive back drills, and fielded punts and kicks in front of about 26 NFL scouts and three CFL scouts on Tuesday at the turf field inside the FAU track. “I just wanted to really show that I could do multiple things,” Franklin said. From there Franklin transferred to Auburn where, after losing a quarterback battle, he moved to wide receiver. 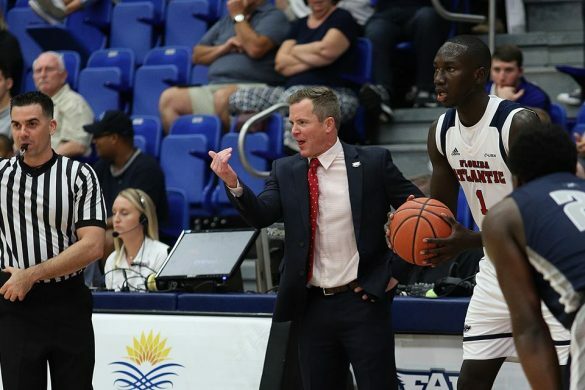 Franklin completed his career with on season at FAU. “I felt like my receiver routes were crisp – really wanted to show that,” Franklin said. Franklin caught seven passes for 95 yards and a score. He also rushed for 229 yards and two more scores on 16 carries. Franklin jumped 10 feet, eight inches in the broad jump, best of the day by six inches. He elected to forego the bench press, knowing he’d need his strength for the individual workouts. Late last week, Franklin learned he might also be asked to try some defensive back drills. “Never played DB a day in my life but I did the drills,” Franklin said. Racing through a disruptive wind, Franklin ran the 40 in 4.38 on one scout’s stopwatch. Running back Buddy Howell ran the second-fastest time – a 4.52. Receiver Kalib Woods ran a 4.55, fellow receiver Kamrin Solomon a 4.66. 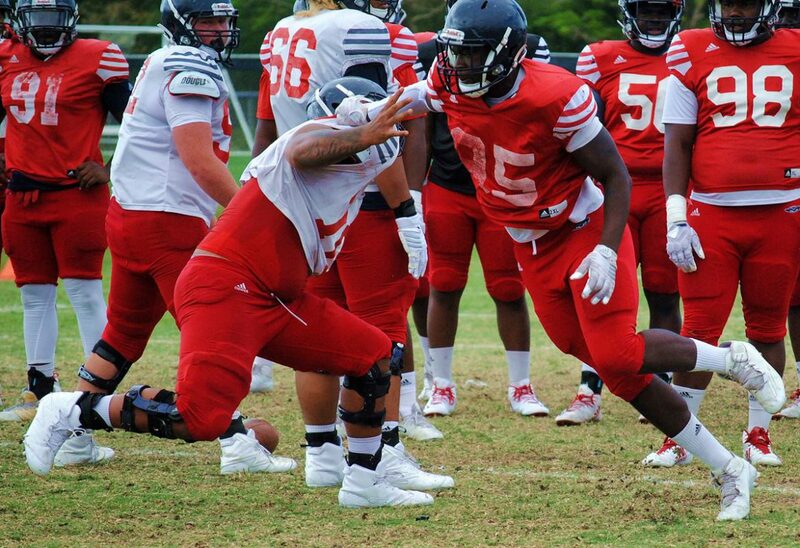 All-Conference USA guard Roman Fernandez benched 225 pounds 33 times, most among the Owls. Fellow guard Jakobi Smith followed with 31. 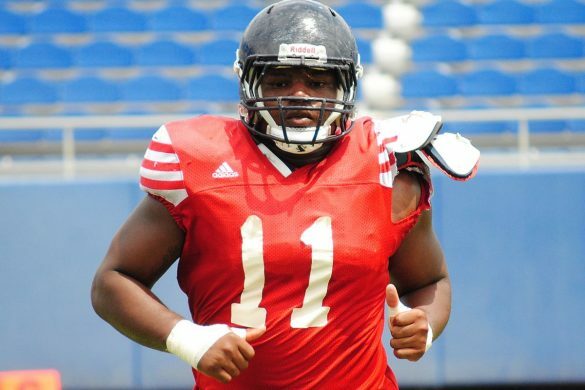 Center Antonyo Woods, an All-Conference USA selection himself, managed 26 repetitions. 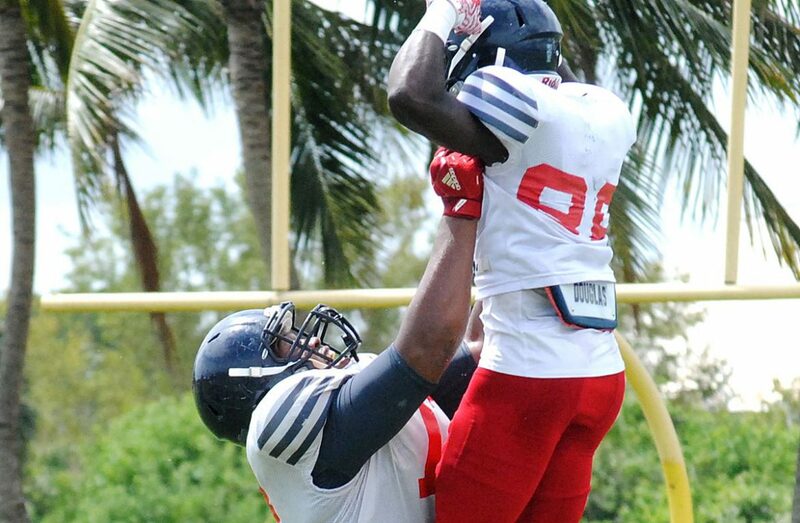 BOCA RATON – Safety Jalen Young showed he could be the next FAU red zone threat. 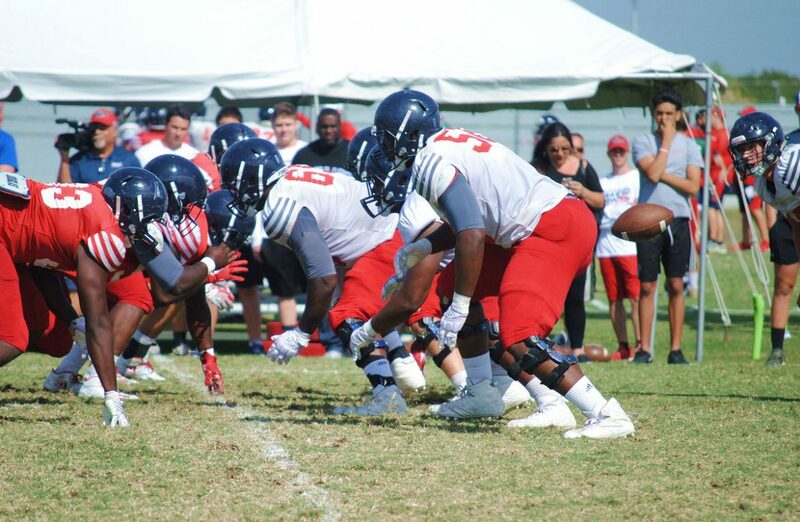 The Owls’ All-Conference USA safety lined-up behind center at the close of Tuesday’s practice as coach Lane Kiffin elected to have the offense play defense and the defense play offense. Defensive players took five snaps from the five yard line, with the offensive guys lined up to try to stop them. Young scored on the final two plays, rushing straight up the middle once and keeping the ball on an option play. Young’s seven interceptions tied for second most in the nation. 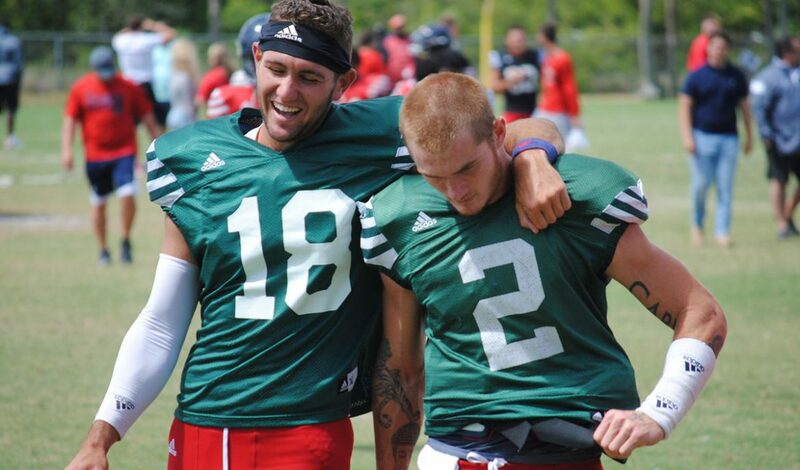 He also returned punts for FAU. 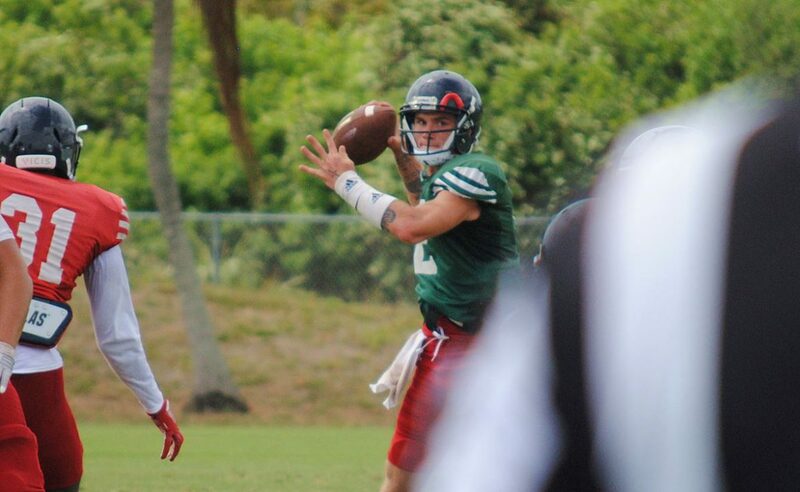 A standout in the defensive backfield dating back to Seminole Ridge High School, Young also moved to quarterback as a senior when injuries left the Hawks without a signal caller. On Tuesday’s final play Young wasn’t about to pitch the ball to his railing running back. On the other side of the ball, Devin Singletary showed he might also have a future as a linebacker, too. 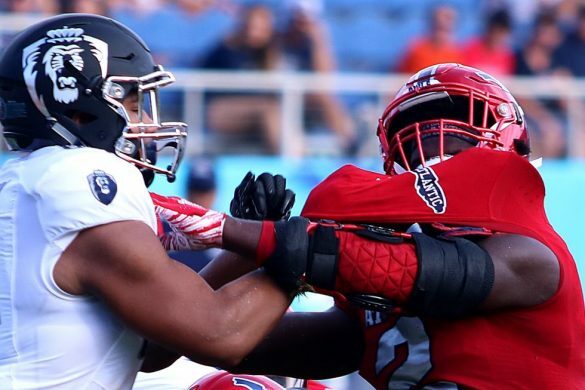 The back known as “Motor” – the same guy who led the nation with 32 rushing touchdowns last season – delivered the biggest blow when he drilled safety-turned-wide receiver James Pierre – who was attempting to score on a reverse. The hit caused teammates to erupt in celebration. Singletary’s blow impressed some teammates. The fact that Young and Singletary led the charge during the role reversal didn’t surprise Kiffin. 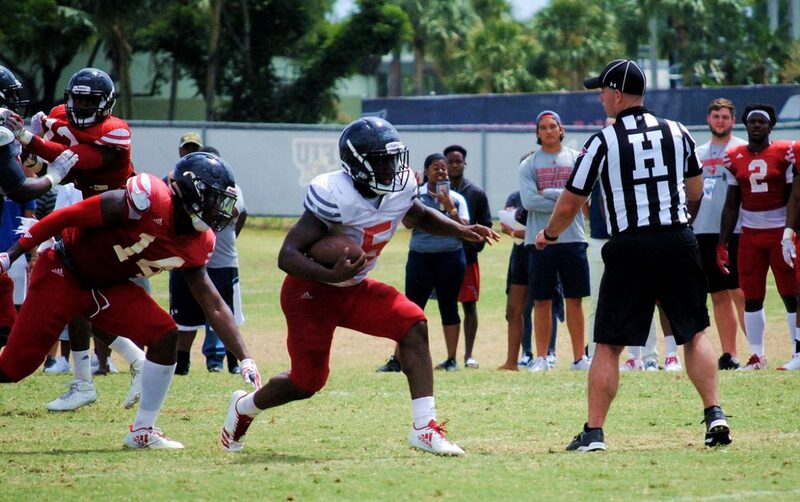 BOCA RATON – D’Anfernee McGriff didn’t play running back last season but he feels quite at home in that meeting room. 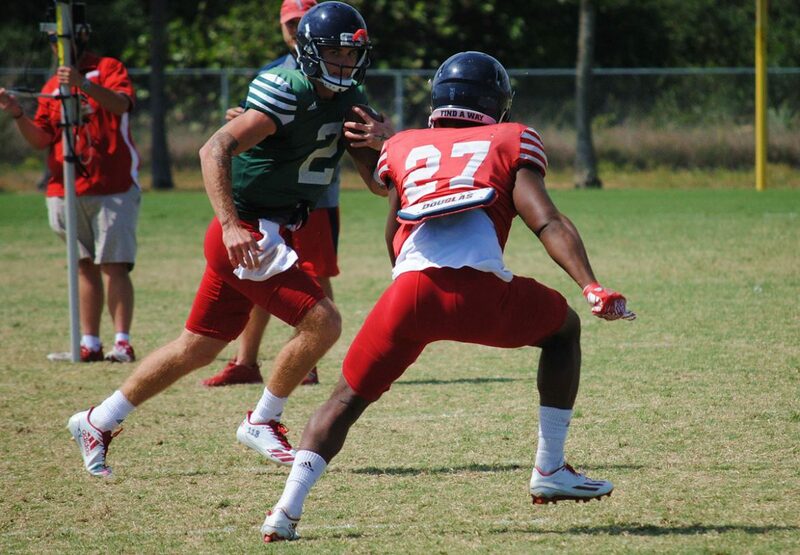 A wide receiver who moved to tight end midway through last season, McGriff spent the first week of spring practice as a ball carrier. McGriff isn’t exactly a stranger to the position. Out of his school he signed with Florida as a running back, but ended up attending Iowa Western Community College. “He’s got good ball skills, good vision, kind of LenDale White-style body,” coach Lane Kiffin said. 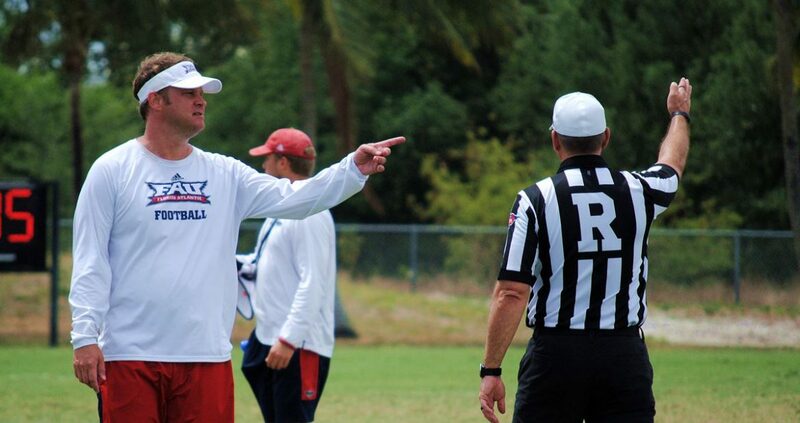 Kiffin served as White’s offensive coordinator before the big back graduated to the NFL. White lost 23 pounds in the offseason to get closer to 200 pounds. He runs with an upright style, but does show a deceptive burst once he cracks the line of scrimmage. 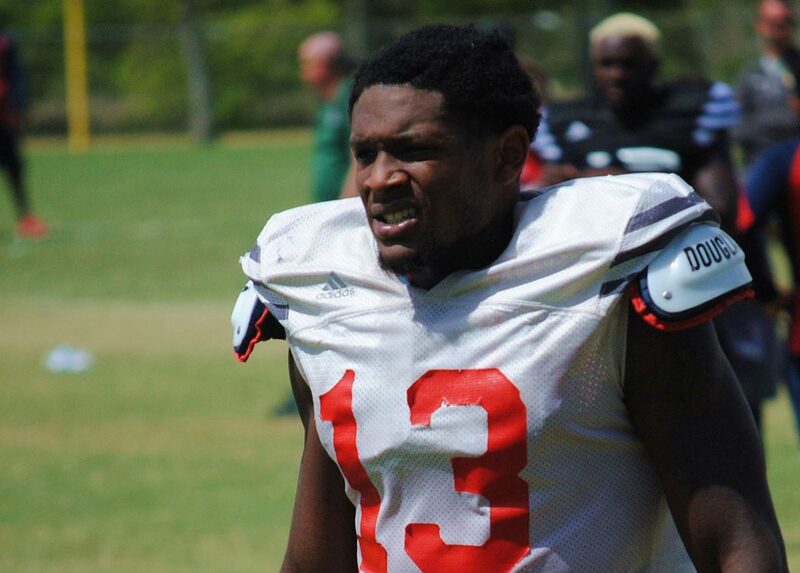 That speed is part of what attracted Florida’s attention. 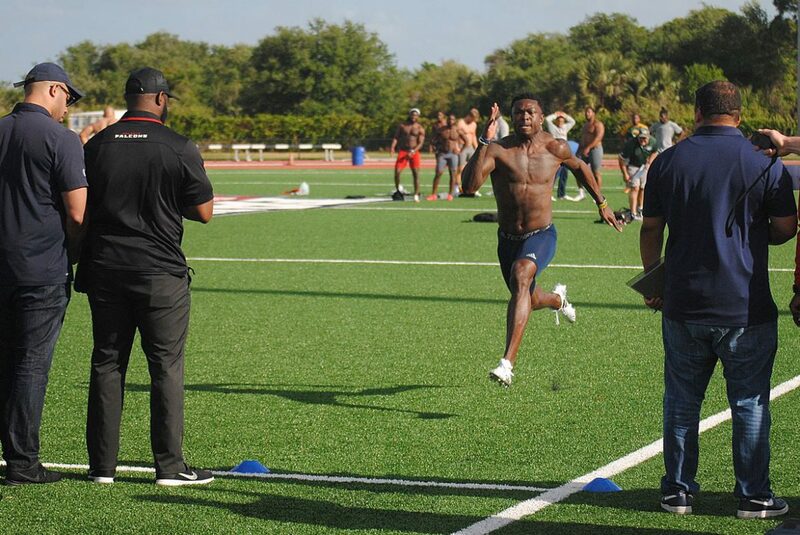 McGriff said the last time he ran the 40-yard dash was back in high school. He ran a 4.34. 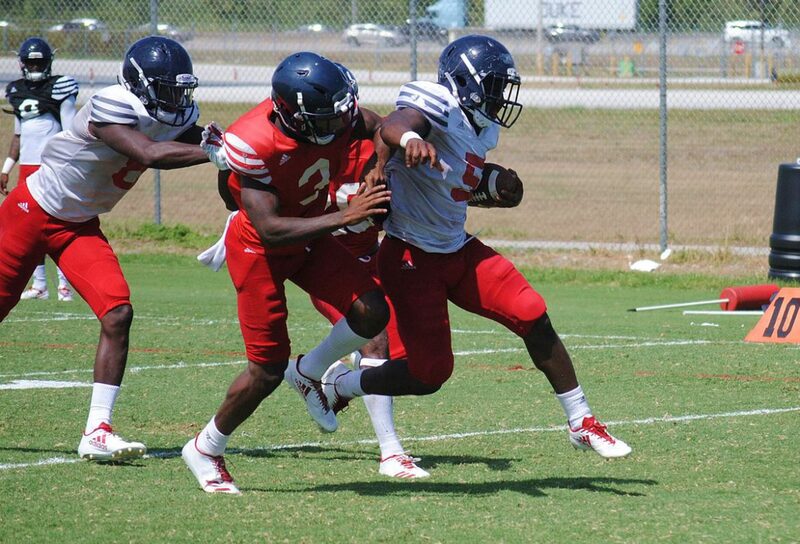 McGriff’s move adds depth to a running back position hit hard by graduation and injury. 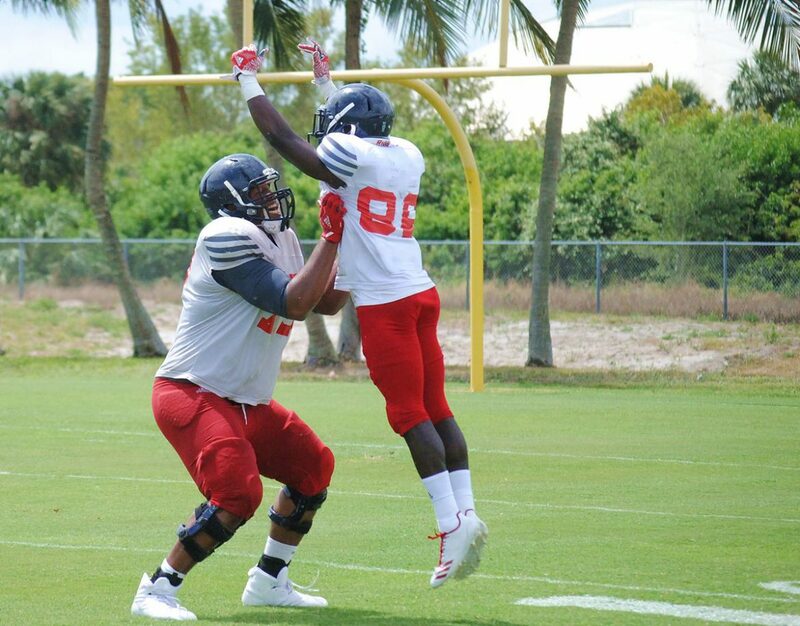 Feature back Devin Singletary returns, but Buddy Howell and Marcus Clark will both be showing off their skills in front of NFL scouts on Tuesday during FAU’s Pro Day. Tyrek Tisdale is still recovering from a knee injury suffered last season and is being withheld from contact. With running backs Malcolm Davidson and B.J. 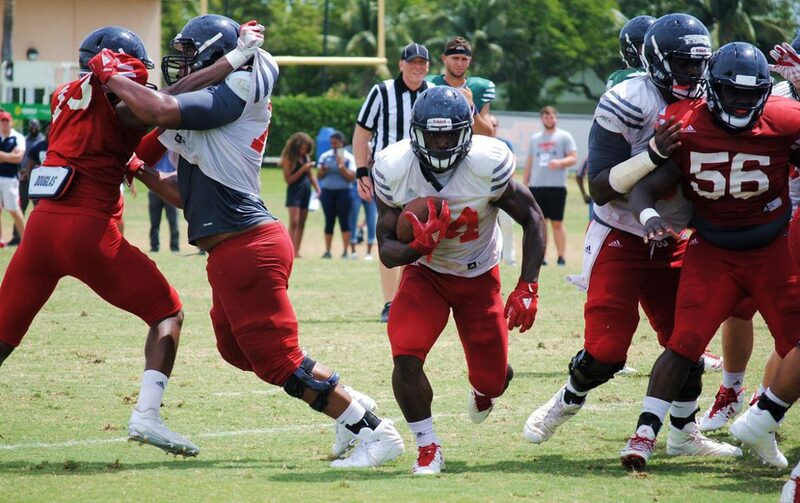 Emmons headed to FAU in the summer, McGriff’s time at running back could be temporary. 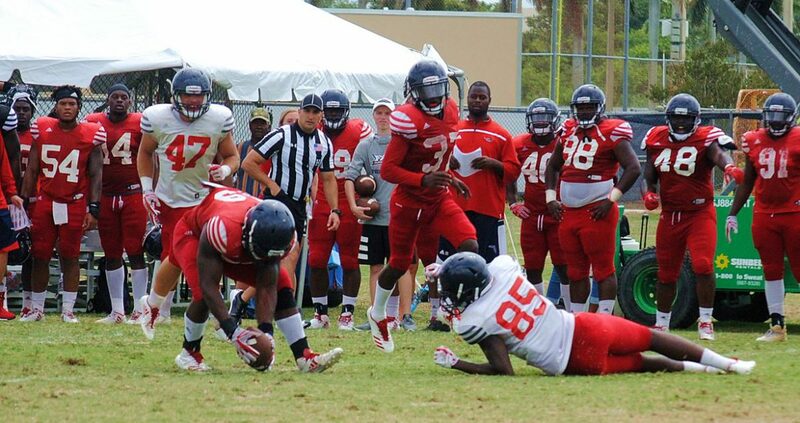 Even if that is the case, it’s clear FAU is trying to find ways to incorporate McGriff into the offense. “It’s exactly how I look at it,” McGriff said. No. 15 Southern Miss scored five runs in the third inning and kept adding on in a 14-3 victory over Florida Atlantic that allowed the Golden Eagles to claim the weekend series 2-1. Matt Wallner smacked a two-out grand slam off FAU starter Vince Colleti in that third inning that essentially put the game out of reach early. Colletti surrendered six runs on seven hits in 3 2/3 innings to take the loss, dropping him to 1-2 on the season. 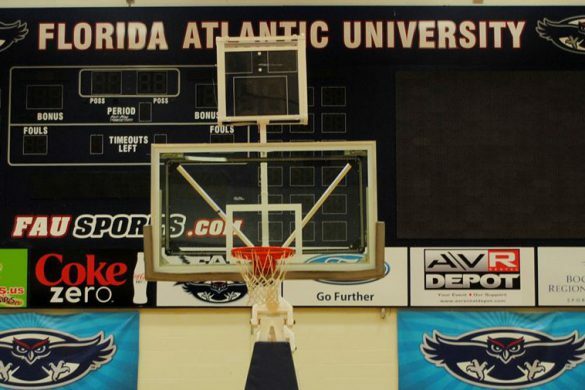 FAU has now lost consecutive games at home for the first time this season. Moving Forward: Tyler Frank reached on an infield single to extend his hitting streak to 19 games. Mike Ruff struck out three in 2 2/3 scoreless innings. …David Miranda had three hits, as did Pedro Pages. 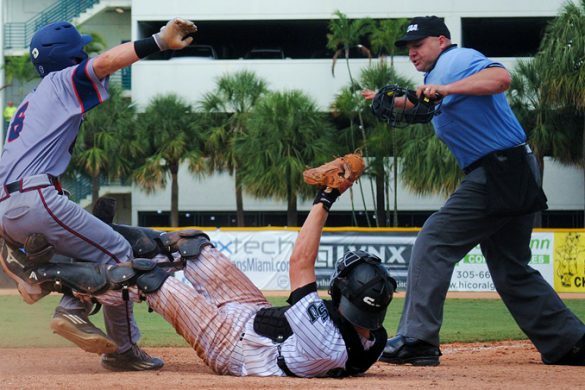 Sliding Backward: Nick Prather surrendered two runs on two hits in an inning of work. …Dylan O’Conner walked three and gave up three runs in 2/3 of an inning. …Blake Sanderson allowed three runs in 2/3 of an inning. 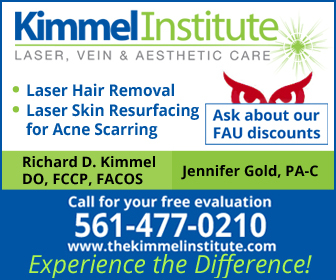 Key Stat: 6 – pitchers used by FAU. 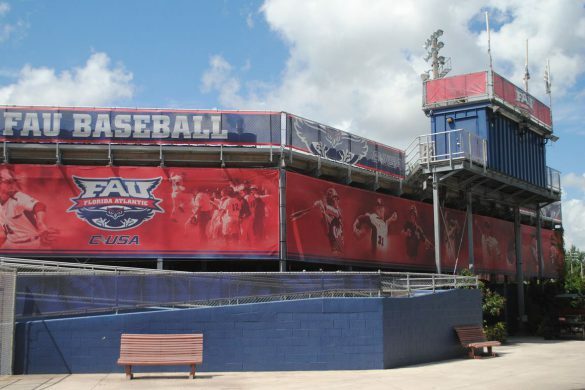 Up Next: FAU hits the road to face Bethune-Cookman on Tuesday at 4 p.m.